Deion Jones comes on a delayed blitz, forcing Rodgers' incompletion. And Crosby's 41-yard FG is wide right. Tough end to promising drive. #Packers K Mason Crosby's NFL-record 23 straight postseason field goals streak ends with a 41-yard kick that sails wide right. That miss ends #Packers K Mason Crosby's #NFL -record streak of 23 straight successful field goals. Still 7-0 #Falcons . Now that's something you don't expect. #Packers K Mason Crosby missed a field goal in the playoffs. He made 23 in a row. Mason Crosby's last missed field goal in the postseason came right here in the Georgia Dome in 2010. #Packers won SB that year, you know. #Packers D has allowed 4 third-down conversions, and another first down after being gifted 1st-and-15. They look hopeless. Big stop for the #Packers defense inside the red zone. Can't afford to go down multiple touchdowns. Field goal makes it 10-0 Falcons. #MoneyMatt ???? connects from 28 yards. Gonna be a lot of points scored today. Field goals are wins. Third-down stops a must. #Packers offense has to be efficient. Brice at safety last 2 times in dime, back from shoulder injury. Kentrell Brice (shoulder) was back for that series, although it didn't help much. #Falcons settle for a field goal. 10-0 Atlanta. What's the line that Lt. Weinberg says to Kaffee after the "strenuously object" scene? "This trial starts Monday." #Packers won't panic. On biggest play of Atlanta FG drive, TED Austin Hooper shifted to far right and no #Packers defender went with him. Gained 15 on 3rd-and-7. End of one in the NFC Championship Game. End of the first quarter: #Falcons 10, Packers 0. 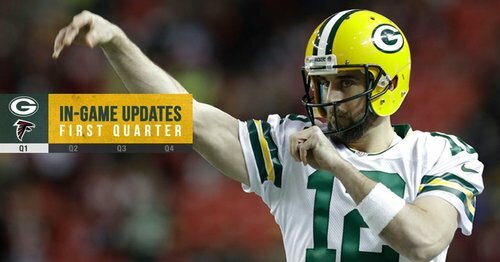 Rodgers essentially gets only one possession in the first quarter. Matt Ryan faced zero pass rush in the first quarter. None. #Packers will lose if that continues. Falcons lead 10-0 after one quarter. Down goes Ripkowski and out comes the ball. That's a fumble and the Falcons have it. First turnover of the day. Ripkowski fumble. Jalen Collins forces and recovers. Touchback. #Packers . That's a killer mistake from FB Aaron Ripkowski. Should be at least 6 points for #Packers today. Instead, Falcons up 10-0 with the ball. That was Ripkowski's first career fumble.